Amazing results to be sure. 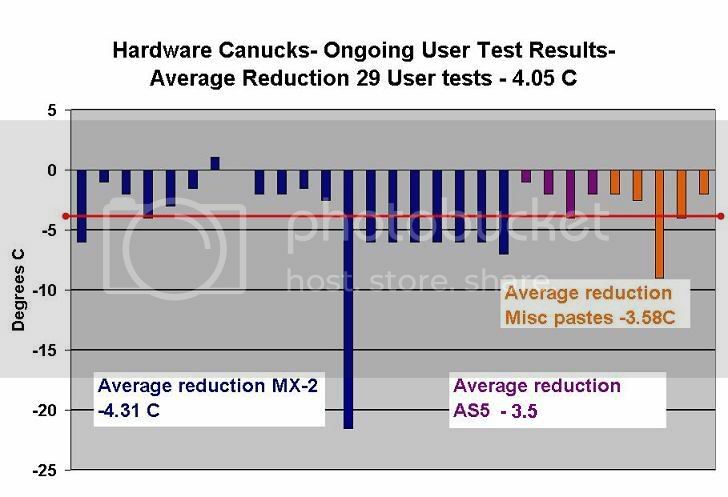 So far my results have not changed from my MX-2. Xigmatek HDT-SD964 with Crossbow backplate, Scythe Kama flex 92mm "push" & Gelid Silent 9 92mm PWM "pull"
My first application was done by wetting the cooler and filling in the grooves on the cooler base with the help of a hairdryer to keep temps up and assist in the spreading. I put a pea sized glob on the cpu heatspreader and used the hairdryer to preheat the cooler in hope that the TIM would flow when the cooler was fastened down. Temps did not change at all so I removed the cooler to check coverage and it was very poor. Basically the TIM followed the heatpipes and did not spread sideways. Next I pre-wetted the cooler again and did the three line method that I have used to get satisfactory results with my HDT coolers, again no change. I will pull the cooler off to check the coverage again but I am now wondering if I have reached the physical cooling limit of this heatsink. With the emphasis on application I do not feel from your description that there was any error there. When we analyzed the no result group to troubleshoot problems 80% were linked to light pressure loads or poor contact. Increasing pressure would be the most likely route. However in most cases I do not like to encourage people to kill themselves trying to get a result, this is a casual test you can let the result stand. Alternatively I could send you some of the Contact/Pressure film to play around with to see if it indicates a direction for improvement if you feel so motivated. Consider me motivated.... ...oh wait...how do you view the contact results again? Unfortunately, I believe that the averages should have both the highest and lowest result removed so they don't bugger up the overall numbers. Well, yeah I agree that my results were a little strange, but I think the math was done wrong. I'm pretty sure that only the load was taken into the average, so from my calculations, (14+14+13+15)/4 = 14, not 21. This stuff is NICE! I let it sit in steaming hot water for 5 mins prior to installation, and it went on good! Spread nicely. Intel Core i7 @ 3.8 GHz, Hyperthreading OFF, 1.245v core, Thermalright Ultra Extreme 120 with 2x120mm push/pull fans @ 1500RPM. Temperatures recorded using RealTemp. Load at 100% for 20 minutes. Idle testing at 0% CPU usage for 10 minutes. All thermal paste used was allowed a 6 hour burn in period at 95% load. All thermal paste applied using pea sized application in center of CPU.